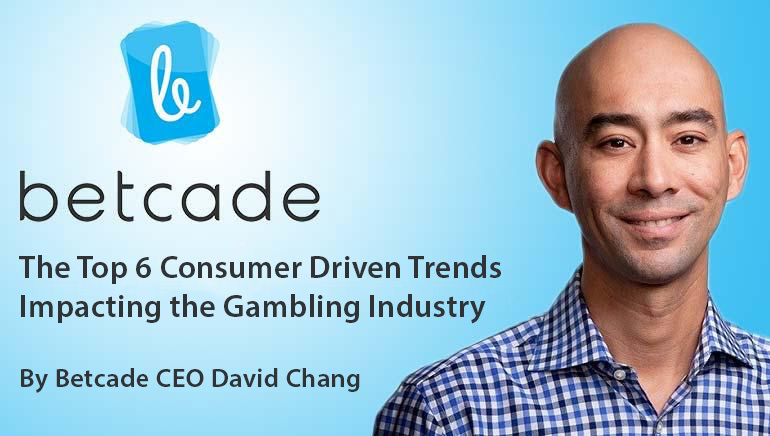 Betcade CEO David Chang delivers a rundown of the six consumer-driven trends that will have a real impact this year. This is an exciting time to be part of the gaming industry. It’s a time of huge change: more competition than ever before and the challenge of engaging with a whole new generation of consumers with entirely new preferences have truly placed the industry at a critical crossroads. Major innovation is happening around all aspects of the gambling industry but here are the top six consumer-driven trends that will have a real impact this year. Mobile growth rates are outstripping all other areas as consumers have shown they want to gamble on the move and be entertained wherever they are. Globally, by 2018, mobile is expected to account for close to half of online gambling revenues. Mobile growth is not cannibalizing existing revenue, rather it’s growing the overall market and attracting new players. For example, we’re even seeing land based casino stalwarts in the US adding on-premise mobile (in advance of full legalization of online gambling) realizing that their players want to play on their mobile devices wherever they are, whether they’re at the pool, the bar, or their hotel rooms. Android is the world’s top mobile OS. In most entertainment verticals the revenue mix for iOS vs Android is 60/40 with iOS leveling off and Android expected to steadily rise. Compare that with gambling’s dismal 90/10. Eliminating the distribution constraints and ensuing workarounds that are contributing to a sub-par player experience on Android not only unlock a major market but more importantly give players the world class experience they deserve, and that they are already accustomed to across all other mobile categories. In all other mobile categories, we are seeing that users overwhelmingly prefer native apps to the mobile web. This trend has gone on for quite some time now and is only expected to continue. Users have gotten very expensive to acquire, so it just doesn’t make financial sense to deliver a subpar experience. In many ways, HTML5, container, and hybrid apps have been a functional necessity due to some pretty severe constraints on mobile distribution from both of the big app stores. Once those constraints have been lifted by new players in the market, native apps will absolutely perform better. Consumers expect to be able to engage with your content when and where they want. They have come to expect a consistent experience at the same level of quality wherever they interact with you. The operators who come out ahead this year will do so by creating a single basic app experience - along with a unified account and wallet - regardless of whether players are interacting with you via web, phone, or tablet. You can think of mobile as the always-on access point to your universal app. It’s going to boost all of your other channels. Netflix is a great example of a brand that fully understands this and has leveraged it to their benefit and the benefit of their users. Studies show consumers presented with too many options find decisions harder to make. Helping players get to what they want more efficiently instead of showing them everything improves their experience as well as your KPIs. Personalization allows you remove the clutter and focus on what each individual player wants, essentially customizing each player’s experience and forging a deeper connection. Players will engage more with an app that addresses their specific needs and abilities. Personalization also contributes significantly to simplification, the final trend I’ll discuss here. In a competitive market, user experience is one of the most important ways to distinguish yourself. You need only look at the runaway success of the minimalistic game Dots to see just how big the trend of simplification is. There are a lot of facets to simplification. There’s the design side where we’re seeing flat design and very simple navigation, and even a trend towards “no UI.” But the more is the simplification of use cases. This is slimming down user experiences into separate apps instead of having a big Swiss Army knife of functionality. A single game will perform better than a heavy, one size fits all app trying to be everything to everyone. This might feel like a risk at first, but this trend towards simplification has met with success in other app genres. Your acquisition and engagement campaigns will be more focused and therefore perform better, players will get engaged and playing more quickly, and better performing games also let you more effectively cross sell into your other titles.